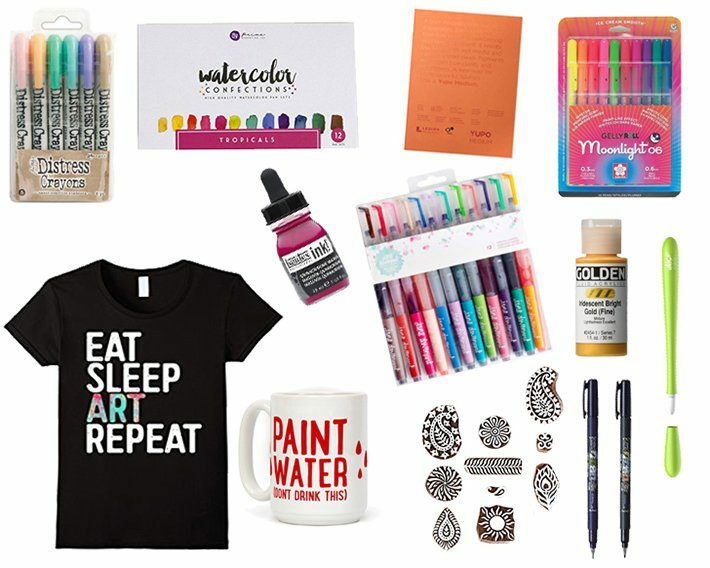 So, you may know, that I am a diehard art journaler fanatic. 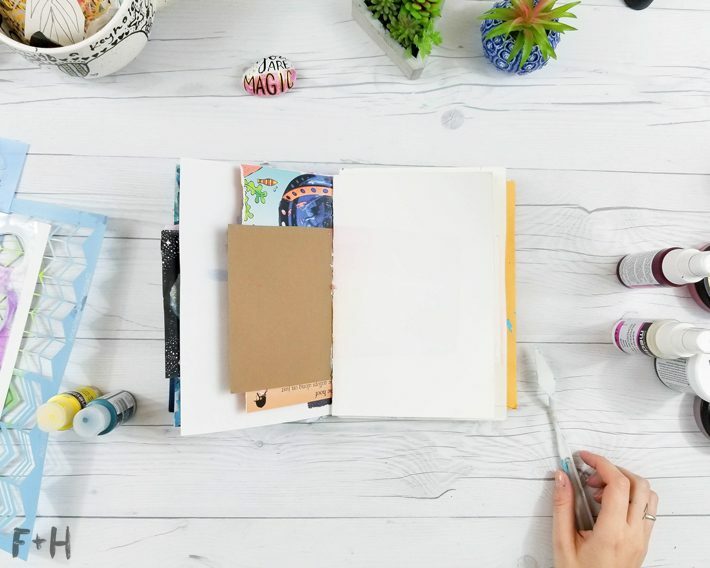 I have more than I know what to do with, and I art journal every single day! 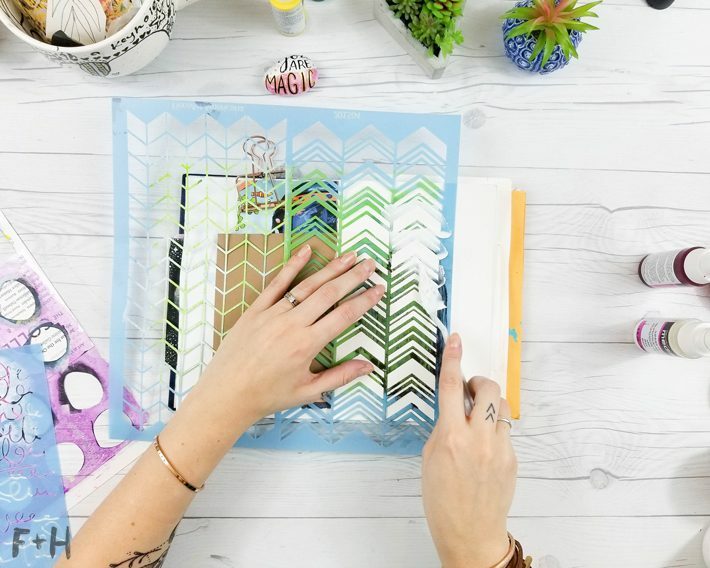 It’s such a great way to create without the pressure of turning out a finished product. 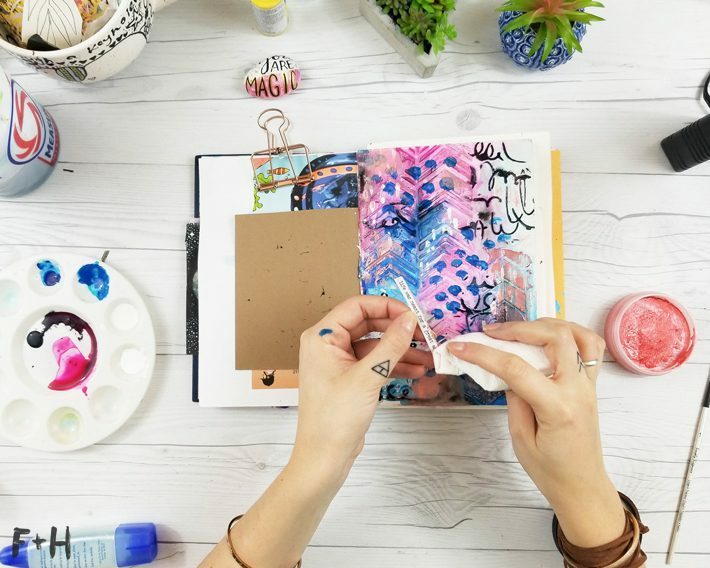 I thought it would be fun to share some art journal techniques today, hopefully, to help inspire you to create an art journal page! 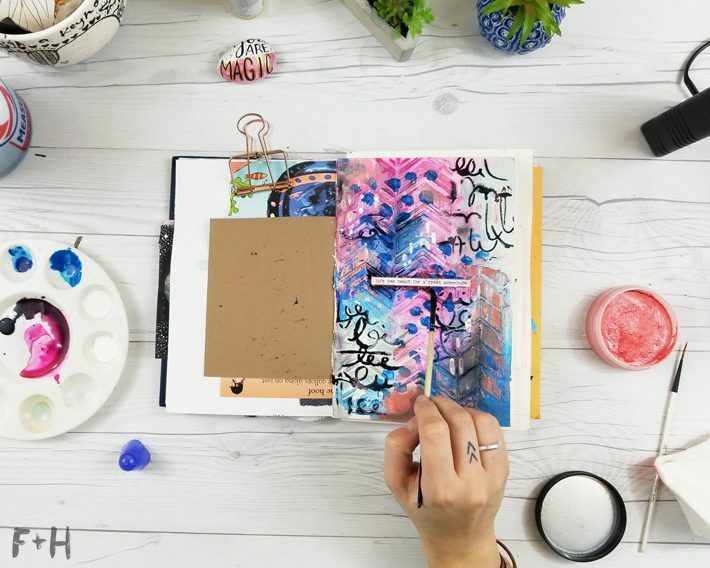 Whether you’re new to art journaling, or it’s also your lifeblood, hopefully this post will get your creative juices flowing! 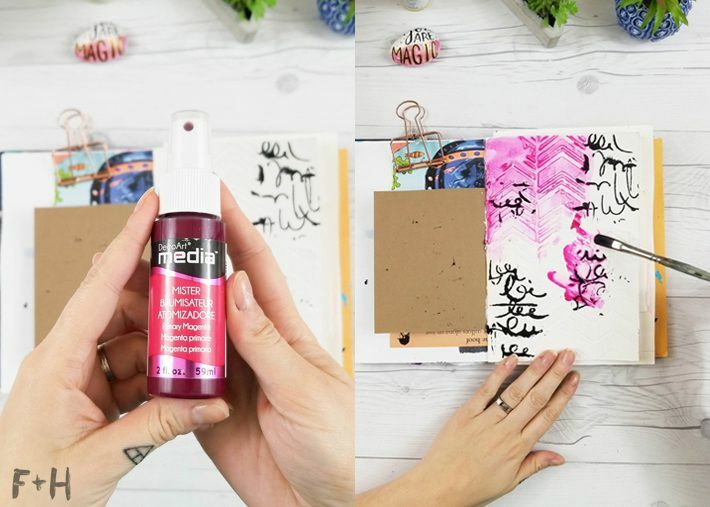 The easiest and most satisfying way to instantly create texture on your art journal page is this: modeling paste + stencil. 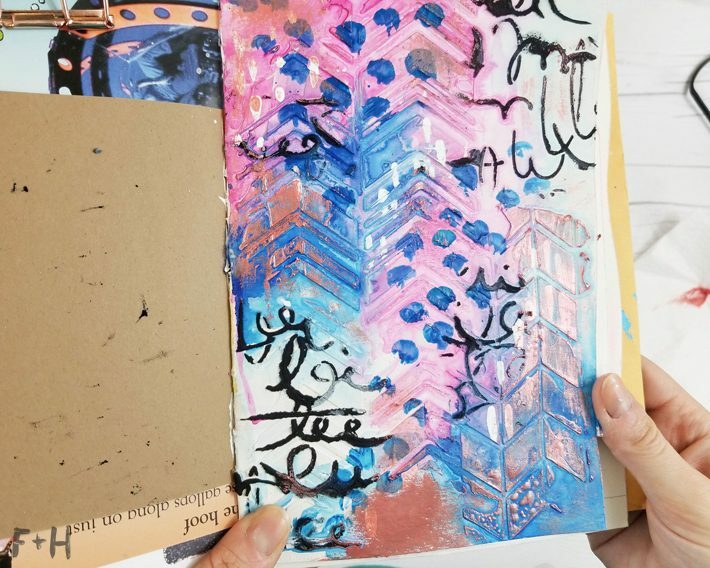 It’s one of the easiest art journal techniques to use, and it always gives awesome results! You’ll pick the stencil of your choice, and then use a palette knife (or old gift card) to spread the modeling paste over the stencil. You want to push it into the design, but not too much or it’ll leak under the edges. Smooth it as best you can, then pull off the stencil. And ta-da! So much great texture!! Let the modeling paste dry completely before moving on. Either air dry, or hit it with a trusty heat gun to speed up the drying. Repeat the stencil + modeling past combo again, but with some black modeling paste. 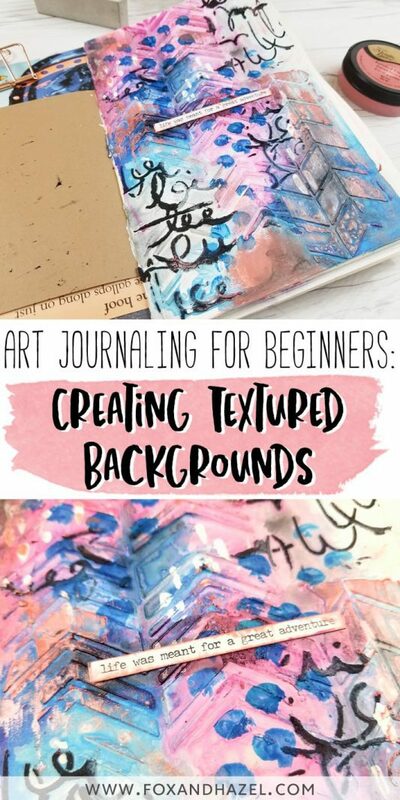 This will help add more texture and some contrast to your art journal page! Next, it’s time to add some paint to highlight that modeling paste. I’m using a Mister in magenta, and instead of spraying it, I’m using it more like a watercolor. 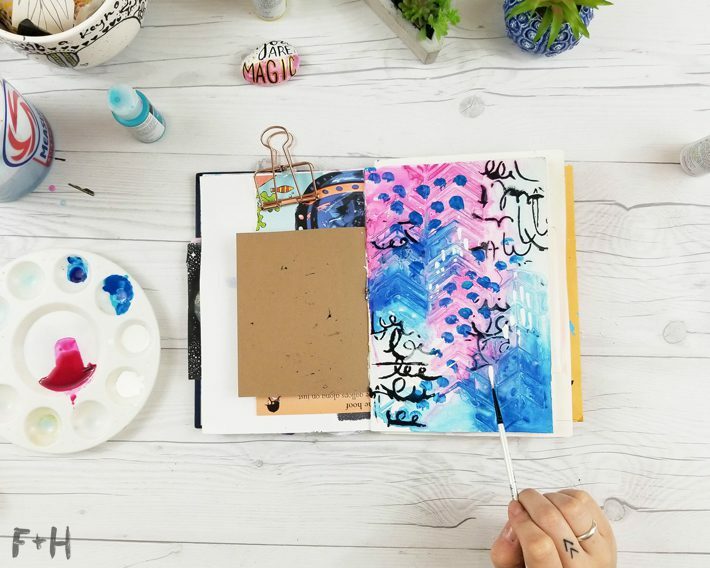 Art journal techniques often repurpose one art supply in multiple ways like this. Once I poured out a bit of acrylic spray, I used a soft watercolor brush to loosely paint around the page. The paint will go into all the nooks and crannies around the modeling paste and pool there, creating contrast on your page. 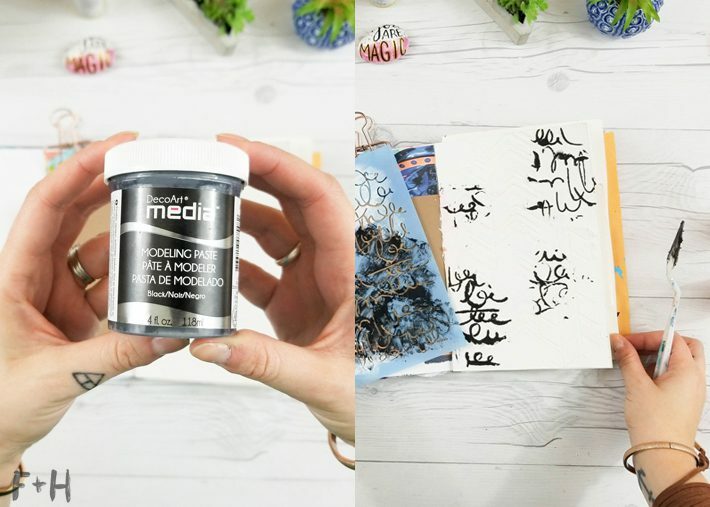 This will help create texture and now you can really see that stencil design! I repeated this again with the Phthalo Blue fluid acrylic watered down. 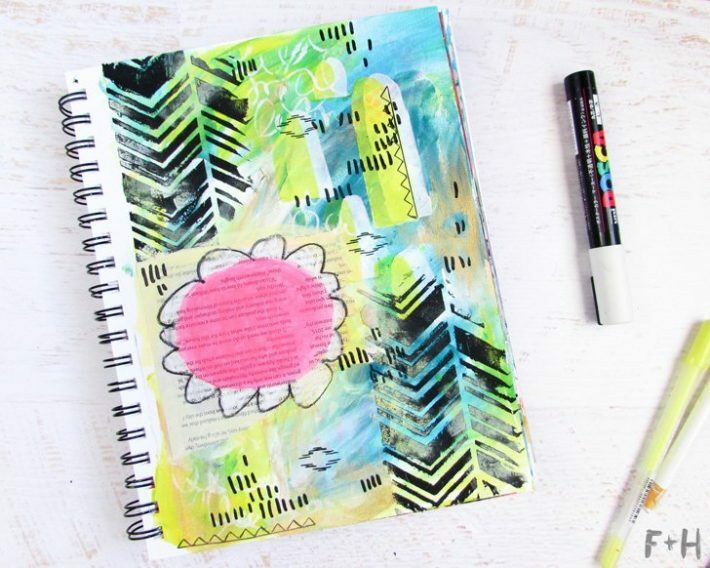 Choose complementary colours that will blend nicely when they mix or you’ll end up with a murky art journal page! Add some details! 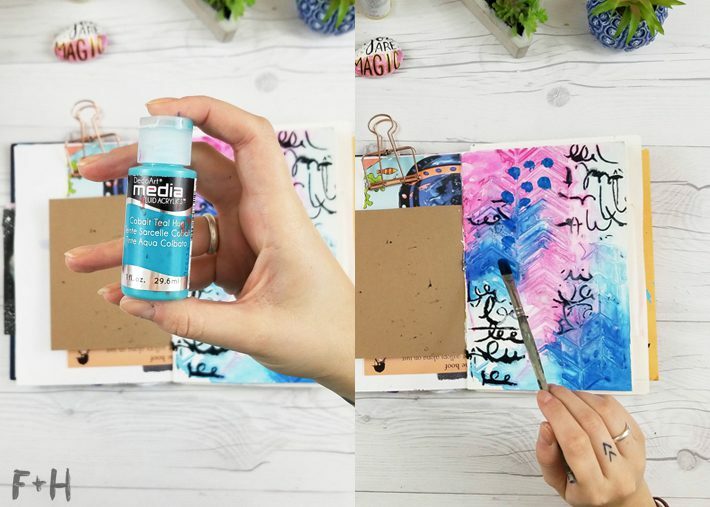 I’ve used a white acrylic Shimmer mister, cobalt teal and titanium white fluid acrylic to add splatters and marks to the page. 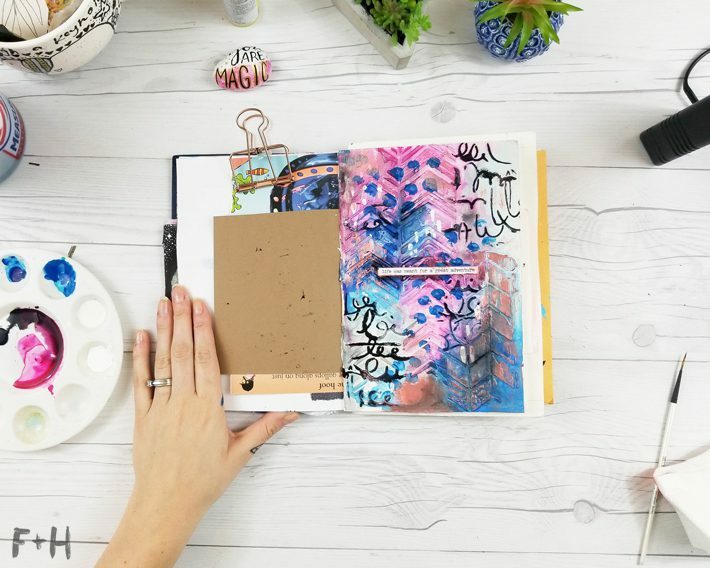 These add more visual interest and create more contrast across the page. Let the paint dry completely. Next, I’m using some Deco Art Metallic Lustre Wax on a piece of paper towel and rubbing it on the high spots on my page. 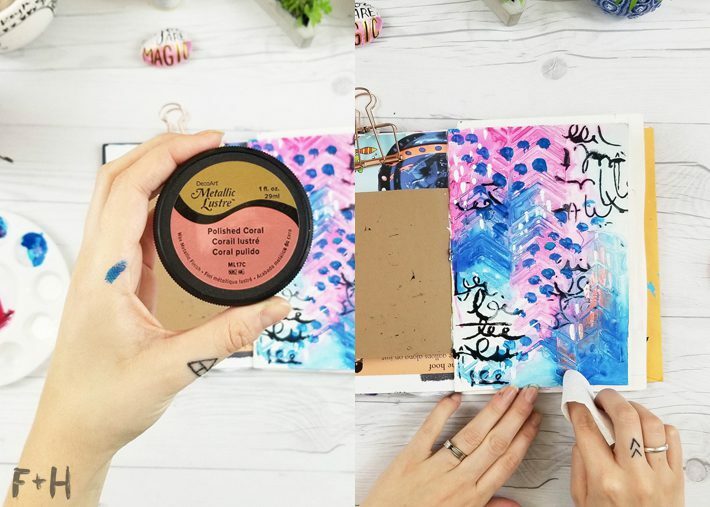 This wax is very shiny and adds some lovely texture to this art journal page! 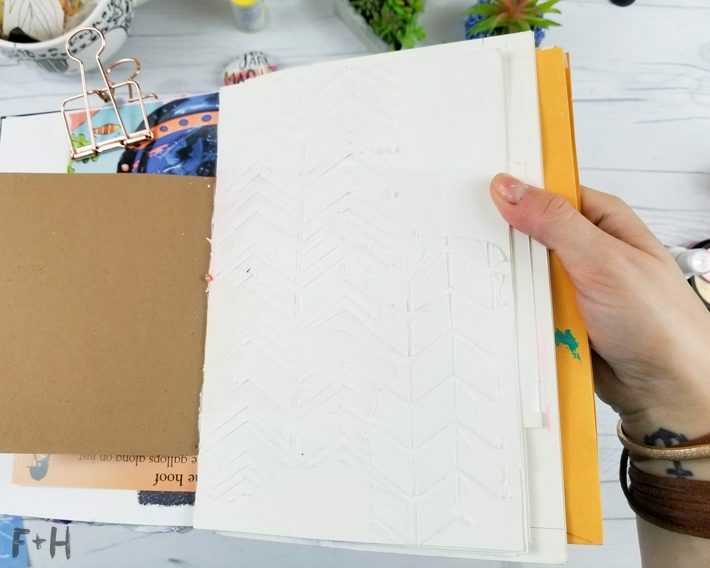 I’ve never used it before, but it’s quickly becoming one of my favourite art journal techniques! To help tone the colors down a bit, so they aren’t so garish, I’ve used some watered down Sumi ink as a sort of glaze. 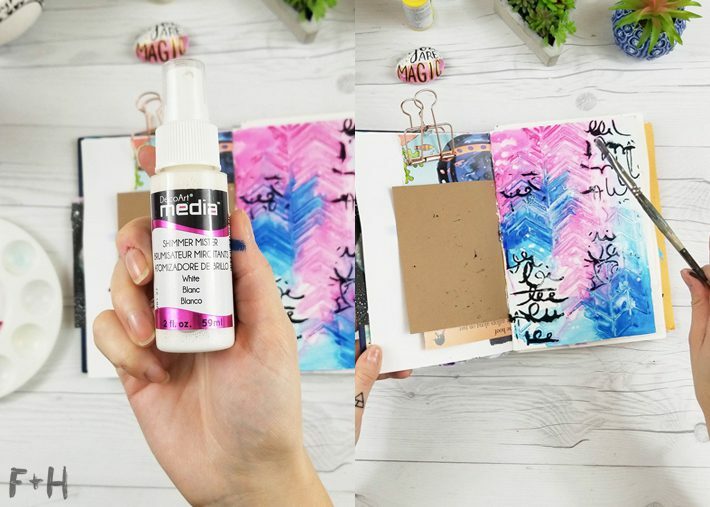 This helps tie in the black modeling paste more, and creates a grungy texture on the page. I’m a big fan of grungy! You could also do this with watercolors or a Stabilo All-Pencil. This page is quite textured, which makes it hard to write on legibly. I grabbed these phrase stickers and picked one I liked. 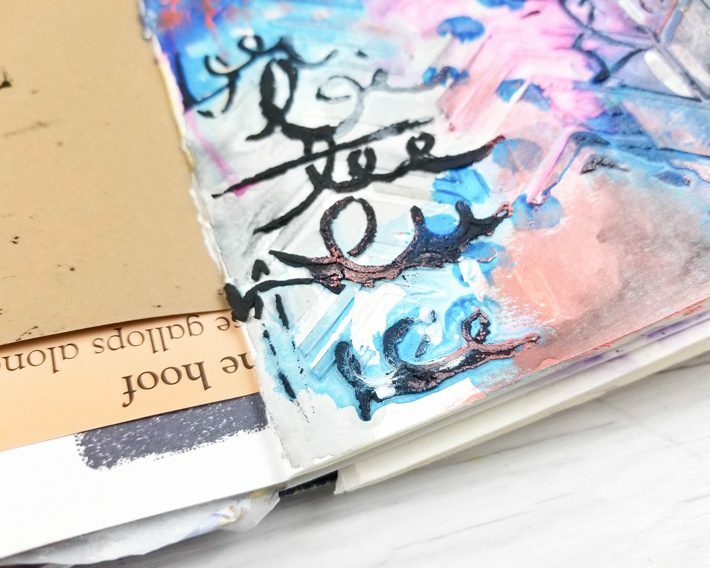 Using the paper towel, I rubbed some of the metallic wax around the edges of the sticker to help it blend in more with the art journal page. 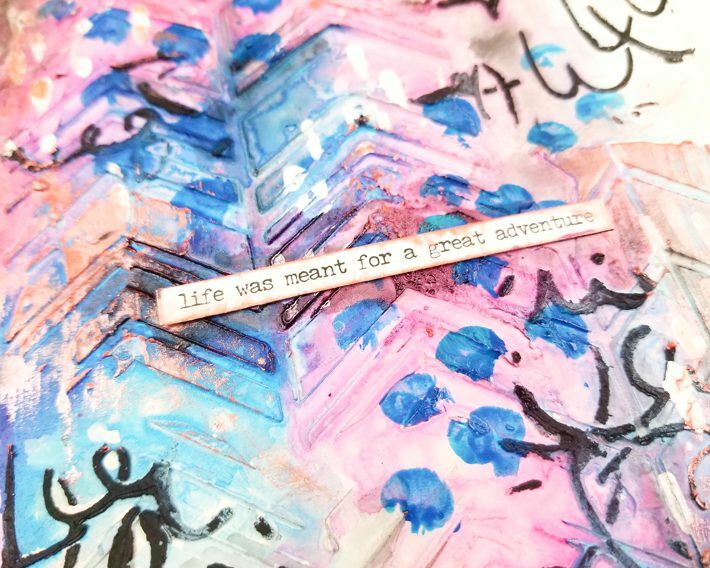 Lastly, I used the sumi ink mixed with the magenta spray to add some more color and depth around the phrase sticker. It helps anchor it to the page, and also integrates the sticker so it doesn’t look like I just stuck something down randomly! And it’s complete! 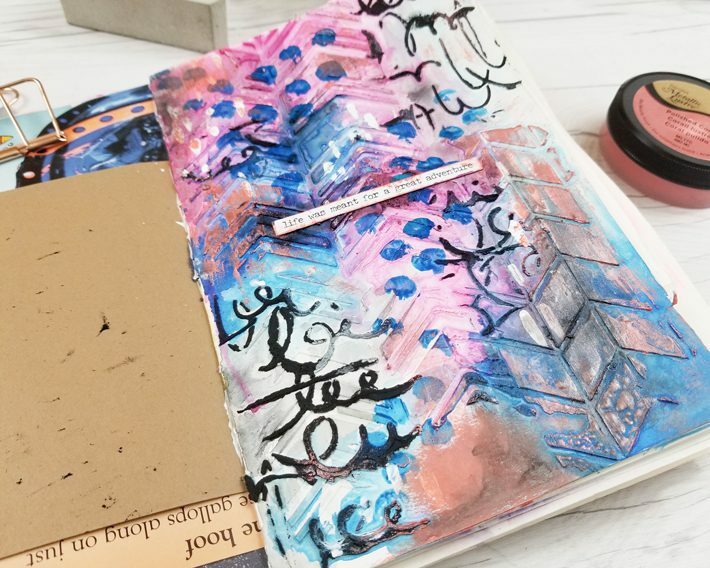 Your textured art journal page is complete! 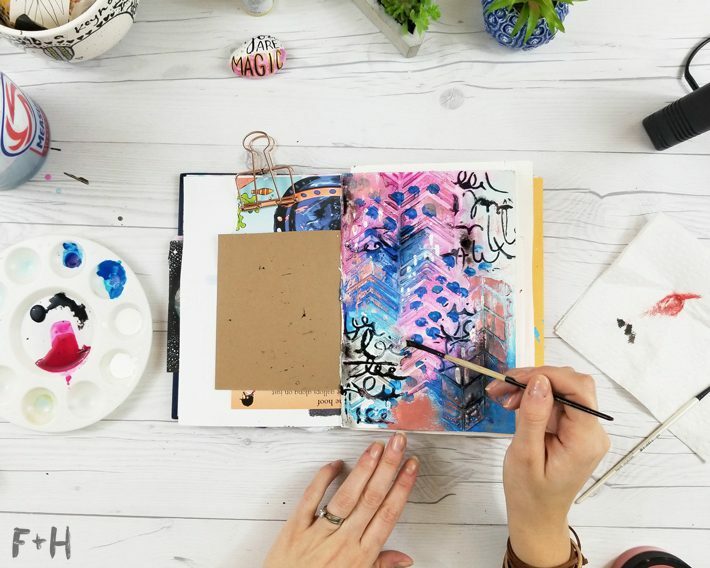 Creating texture with modeling paste and a stencil is one of the easiest and most satisfying art journal techniques, because the results are almost instant. 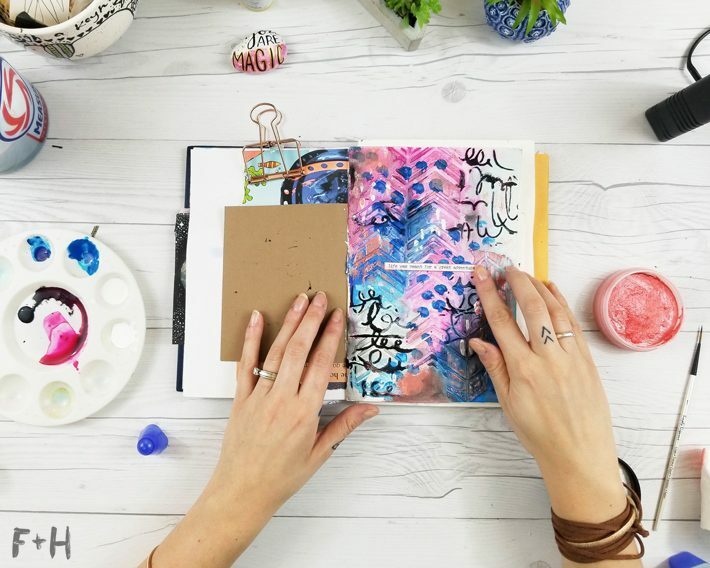 I hope this art journal page inspires you to get messy and create something new! 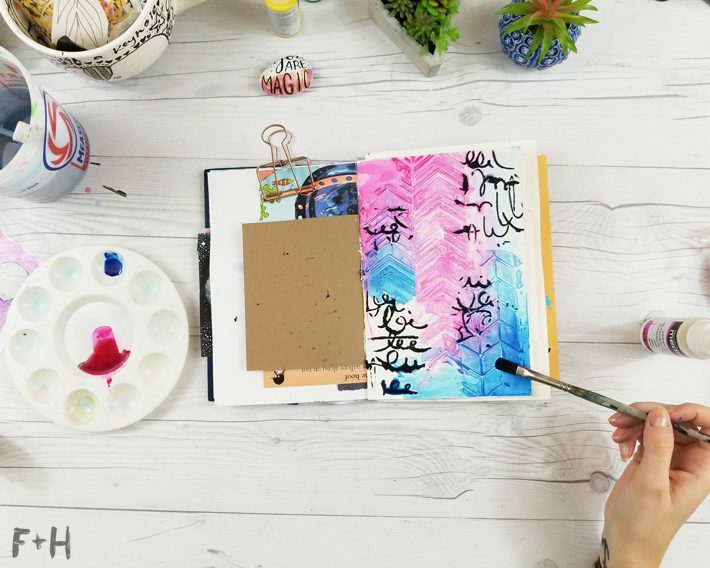 If you’d like more art journal tutorials, be sure to check out this spring art journal page, this buttery fly inspired page and these 12 affordable art journal supplies to get started! 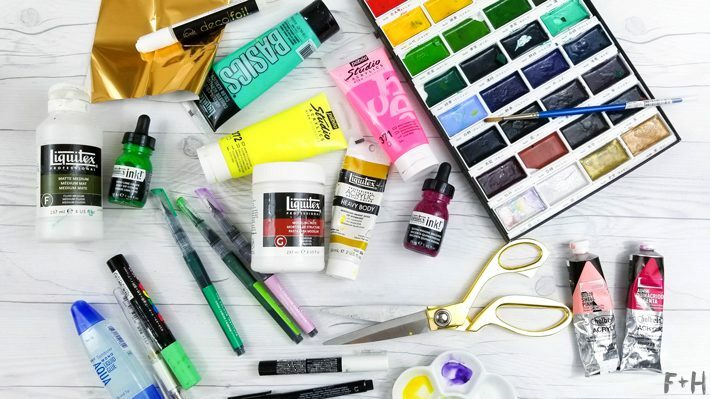 Love art supplies? 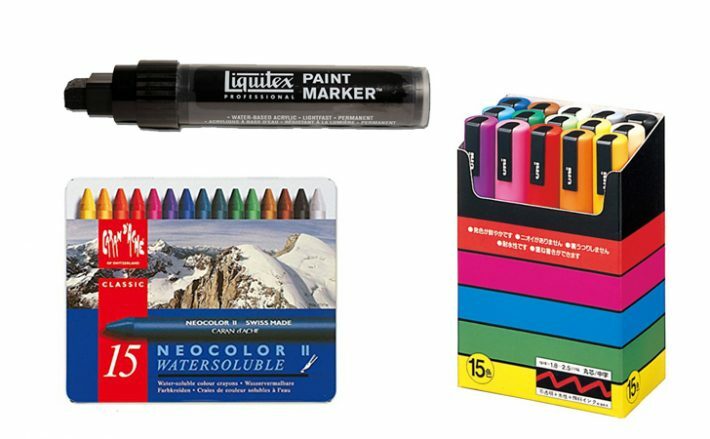 You can check out all my favourite art supplies HERE. 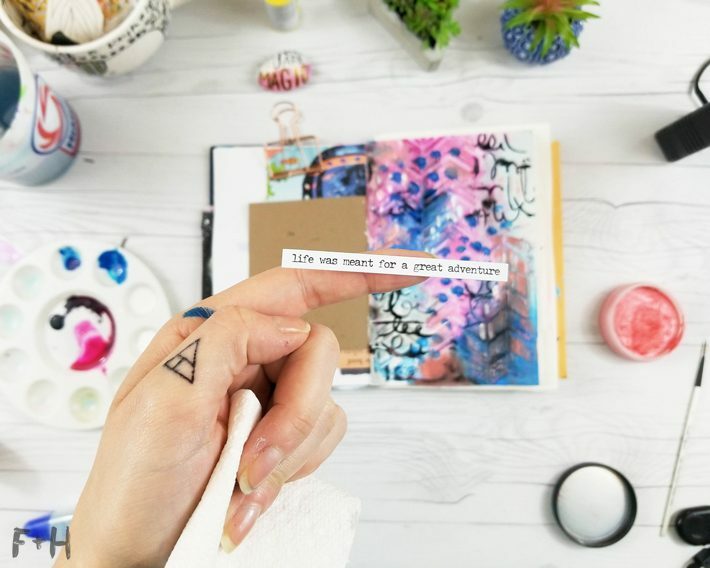 I LOVE your website, just started following a few weeks ago and have used your art as my screensaver, made stickers for my art journal and tried a couple of your tutorials which were fun and inspirational. Just wanted to say thank you and look very forward to more! 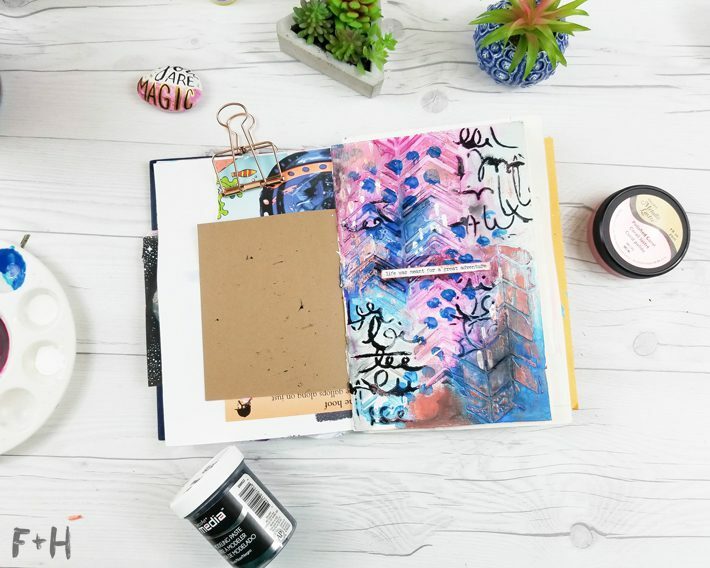 Great art journal page. I love the colors combination.